Re-discovering a forgotten songwriter: the archive of Louisa Matilda Crawford. Daisy Stafford, CRC intern who catalogued the papers of Louisa Matilda Crawford, talks about her experience. Louisa Matilda Jane Crawford was born on the 27th September 1789 at Lackham House in Wiltshire. She was the daughter of Ann Courtenay (d. 1816) and George Montagu (1753-1815), an English army officer and naturalist. Louisa was related to nobility on both sides of the family; her maternal grandmother, Lady Jane Stuart, was the sister of Scottish nobleman John Stuart, 3rd Earl of Bute and Prime Minister to George III. Her father, meanwhile, was a descendent of Sir Henry Montagu, the first Earl of Manchester and also the great-grandson of Sir Charles Hedges, Queen Anne’s Secretary. Where an Eden bloom’d before. Louisa began courting Matthew Crawford, a barrister of Middle Temple, in 1817. Many of the papers consist of love letters and poems exchanged between the pair during this early period of their relationship, including three locks of hair, presumably Louisa’s. In 1822 the couple were married and Louisa moved to London, although their continued correspondence evidences that Matthew spent much of their marriage away working in the North of the country. It is then that Louisa began to earn an income through song writing and poetry, although the couple always struggled financially and frequently appealed to their wealthier relatives for aid. Stood Frederick’s self before him! Coll-1839/1/2/5. 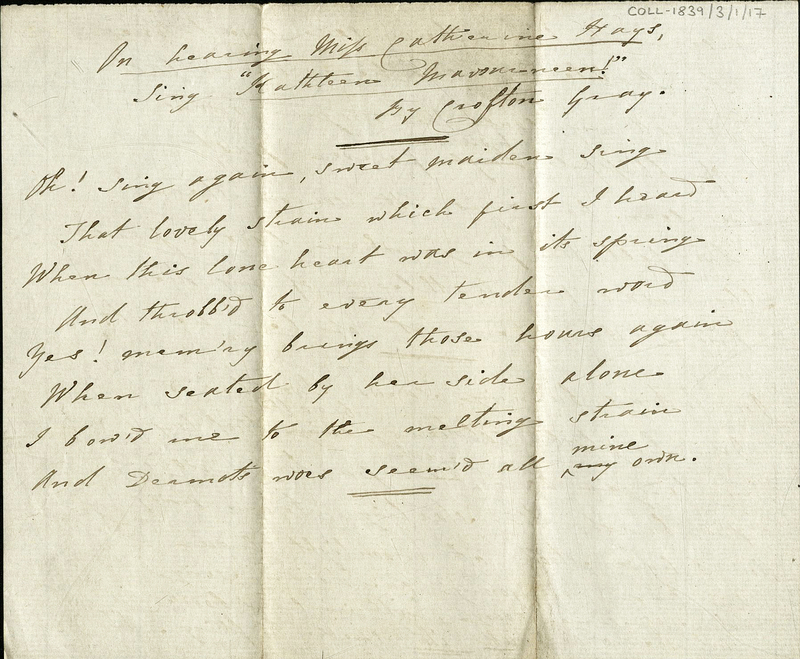 Poem addressed to Matthew Crawford titled “To Him I Love” in the hand of Louisa Matilda Crawford, 23 July 1817. 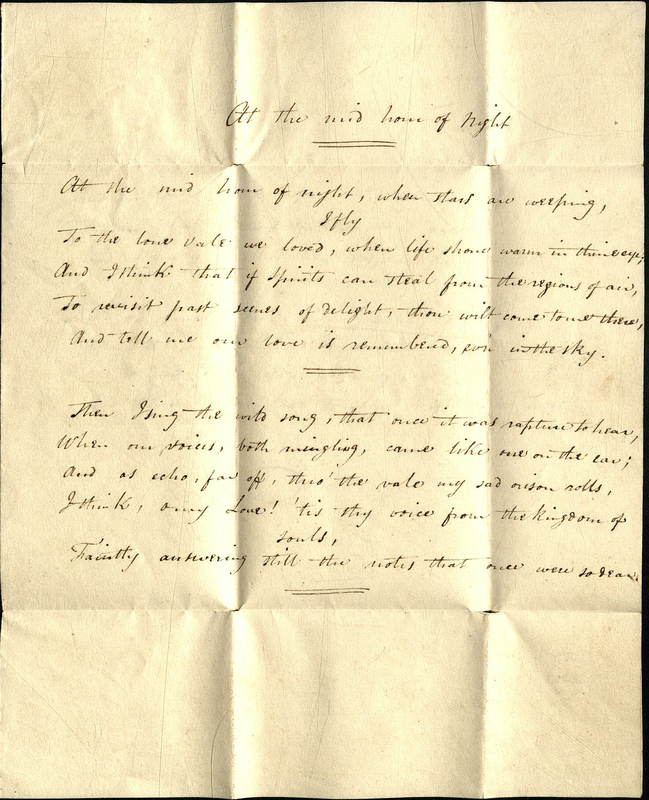 Matthew often responded with poems of his own, and seems to have played a collaborative role in Louisa’s writing. She frequently included stanzas of her work in letters to him, asking him to look over and edit them. Louisa’s most successful song, “Kathleen Mavourneen,” was set to music by composer Frederick Crouch and enjoyed wide success in America where it was popularised by Irish Soprano Catherine Hayes on her international tours. Recordings of it still exist, and a version by Irish tenor John McCormack (1884-1945) can be found on youtube here. 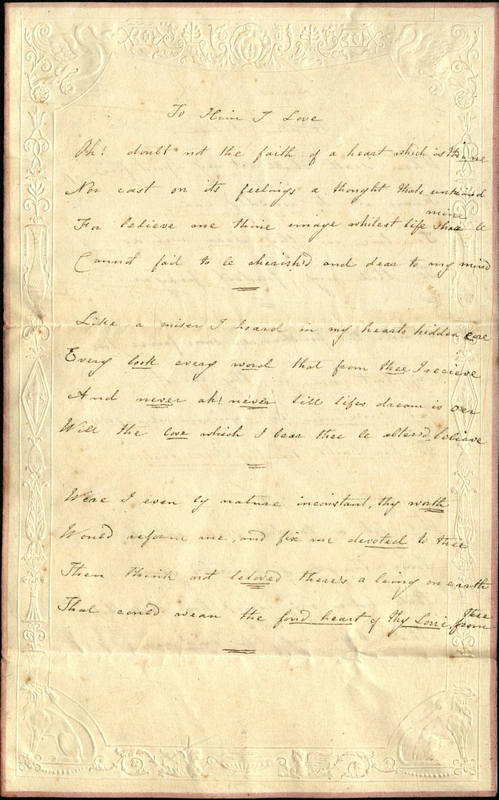 No original version of the song is amongst her papers, although there is a poem titled “On hearing Miss Catherine Hays [sic] sing “Kathleen Mavourneen!”” (Coll-1839/3/1/17). However, the song was frequently attributed solely to Crouch, or erroneously to Annie, Julia, or Marion Crawford. Coll-1839/3/1/17. Poem titled “On hearing Miss Catherine Hays, sing “Kathleen Mavourneen!” by Crofton Gray” in the hand of Louisa Matilda Crawford, 1837-1857. Louisa arranged her poems into small series, and the collection includes ten stitched booklets with titles such as “Irish ballads” and “Scotch songs”. Attempts to track down her work can be seen in correspondence with her publishers. In an undated later to magazine editor Mr Emery (Coll-1839/1/1/22) she requests copies of her published songs, writing; “I am not wanting them to give away, but to have them bound up in a volume since I find it impossible to keep single songs…I am going to beat up for recruits in all quarters where my bagatelles have been published, in order that I may have a little memorial to leave to those that will value the gift when I am gone.” A notebook containing 165 poems and songs neatly written in Louisa’s hand seems to be the result of these efforts. I enclose a manuscript book written by Mrs Crawford including many well-known songs…Mrs Crawford was a Montagu of the Duke of Manchester family and died in 1857. She was married to Matthew Crawford a barrister. They had independent means which however they frittered away. My late father who was a 1st cousin of Matthew Crawford’s assisted them from time to time and their M.S.S. came to him on their death and through him to me. I am not anxious to part with them, but I am an old man and my family may not attach the same importance to their possession. 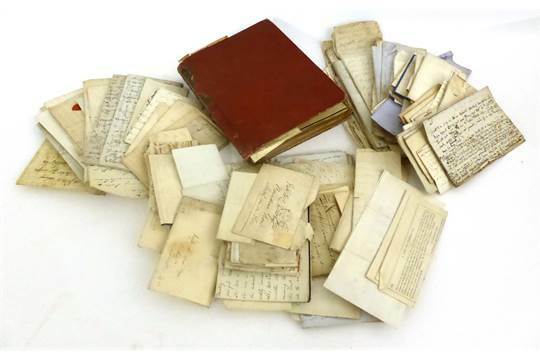 This would seem to account for how the papers came to be in the possession of the bookseller and for the few items relating to the Newby’s present in the collection. Louisa died in 1857, the cause unknown, although Matthew refers to a long affliction of heart disease supplemented by attacks of Bronchitis in an 1846 letter (Coll-1839/2/6). Despite her obvious talent, and the clear enjoyment she derived from her work, she received little notoriety for her song writing during her lifetime and even less so after her death. 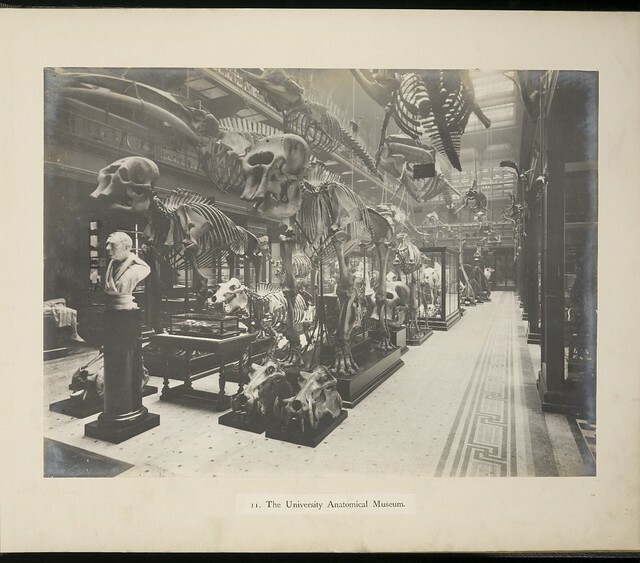 Alongside gaining invaluable archival skills during this project it has been a pleasure to think that I have been able to increase the visibility of Louisa’s work and make her collection available to interested researchers. Although separated by over two centuries, I have come to know more about Louisa than any person living, and that is a great privilege. Cleevely, R. J. “Montagu, George.” Oxford Dictionary of National Biography Online, 23 Sep. 2004, https://doi.org/10.1093/ref:odnb/19017. Accessed 19 Jul. 2018. Crawford, Louisa Matilda Jane. The Metropolitan Magazine. Accessed 19 Jul. 2018. “An Auto-Biographical Sketch. Lacock Abbey.” Vol. 12, Jan-Apr. 1835, pp. 400-402, https://babel.hathitrust.org/cgi/pt?id=nyp.33433081737904;view=1up;seq=412. “Autobiographical Sketches Connected with Laycock Abbey.” 14, Sept-Dec. 1835, pp. 306-318, https://babel.hathitrust.org/cgi/pt?id=nyp.33433081737888;view=1up;seq=322. “Autobiographical Sketches.” Vol. 22, 1838, pp. 310-317, https://babel.hathitrust.org/cgi/pt?id=umn.319510007530342;view=1up;seq=325. “Autobiographical Sketches.” Vol. 23, Sept-Dec. 1838, pp. 189-194, https://babel.hathitrust.org/cgi/pt?id=nyp.33433081737839;view=1up;seq=203. Cummings, Bruce F. “A biographical sketch of Col. George Montagu (1755-1815).” Zoologisches Annalen Würzburg, vol. 5, 1913, pp. 307–325, http://www.zobodat.at/pdf/Zoologische-Annalen_5_0307-0325.pdf. Accessed 19 Jul. 2018. “Kathleen Mavourneen.” Wikipedia, https://en.wikipedia.org/wiki/Kathleen_Mavourneen. Accessed 19 Jul. 2018. Pratt, Tony. Two Georgian Montagus: the manor of Lackham. Wiltshire College, second edition, 2015, https://tinyurl.com/y7tpp39h. Accessed 19 Jul. 2018. Urban, Sylvanus. “Obituary – Rev. George Newby.” The Gentleman’s Magazine, vol. 26, 1846, pp. 100-101, https://tinyurl.com/yatonw6n. Accessed 19 Jul. 2018. Written by Daisy Stafford, July 2018.